Armstrong Steel's clients now have access to the fastest lead times in the pre-engineered metal building industry, with the ability to obtain wet-stamped blueprints in as quick as 24 hours! DENVER –Armstrong Steel Buildings, widely recognized as America’s #1 steel building company, has recently formed a new Department of Engineering that will address a broad range of issues including customer wait times for permit drawings and/or wet stamped blueprints. The department’s primary goal is to reduce Armstrong customers wait times for stamped blueprints on lower complexity jobs to under 72 hours. “We constantly strive to pinpoint areas in our process that may be improved upon, understand how it affects our clients, and take action to ensure we are always providing our customers the best experience the industry has to offer,” said President & CEO Ethan Chumley. Ultimately, the results of their work will lead to new methods for maintaining speedy lead times & superior customer satisfaction. “Our clients deserve better than the ‘two to three week wait periods’ for drawings that have become commonplace in the pre-engineered steel building industry. Armstrong Steel has always strived to cater to clients with tight timelines and high expectations and this is just one more reason to choose Armstrong,” said David Nardozzi, General Manager. 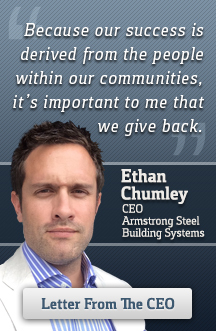 Members of the new department are playing a key role in developing steel buildings policies, actions, and procedures through collaborations with clients as well as Armstrong’s various sales departments. Standard procedures have been established that promise to deliver blueprints in half the time while saving clients on overall steel buildings costs. Eric Beavers, VP of Operations, prepared the framework for the creation of the new department. Beavers hopes to further round out the department with new personnel. “We are recruiting experts in their fields and we look forward to accepting a group of exceptional detailers and engineers with diverse interests and backgrounds,” Beavers said.